The Indiana Jones saga was complete. He had trumped the Nazis, saved his father’s life, solved one of the greatest archaeological mysteries, and ridden off into the sunset with his companions. At least, until now. 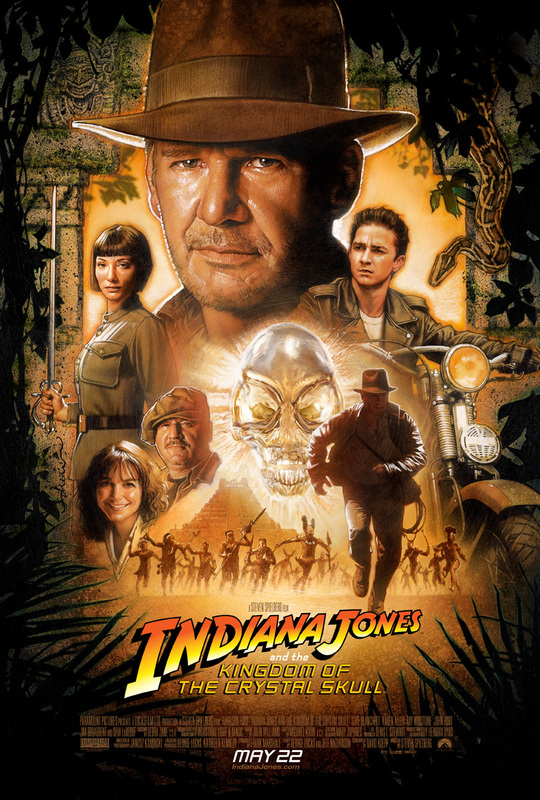 The recent spate of late-coming sequels and series restarts no doubt to a large extent prompted Indy’s return to the silver screen, and whilst this is no bad thing by itself, it does however spoil the rather nice ending to the previous series finale Indiana Jones & The Last Crusade. Although Sean Connery declined to come out of retirement for the film, the late Denholm Elliott sadly missed, and there being no part for John Rhys-Davies, the film’s still alluring combination of George Lucas, Steven Spielberg, John Williams and Harrison Ford will no doubt kick this film to the top of the box office. The problem is that the potential for disappointment runs almost as high as it did for Lucas’ own Star Wars Episode 1: The Phantom Menace, and one imagines that The Crystal Skull will only suffer as a result. The Kingdom of the Crystal Skull isn’t as good as classic Indy, that’s for sure, and it does rather ruin the previously well-rounded ending to the series. The first thing that strikes is that Harrison Ford really is a lot older now. He has the charisma to pull the character off, and that counts for a lot, but when it comes to the action sequences it really shows that the reactions and flexibility of old simply aren’t there any more. One thing that really seems to have griped a lot of fans is the realism factor. I imagine this partly comes since a lot of us just aren’t the youngsters we were when we first saw Indy. The original Raiders of the Lost Ark was released back in 1981, so even people currently in their 40s may have only been young teenagers when they first saw that absurdly clad archaeologist creating mayhem in the desert. That similar loss of magic no doubt dispelled a lot of Star Wars fans’ hopes when the prequel trilogy was released. Yet where the recent Star Wars trilogy had a reason to be made—the episode numbers were blank and the story untold—The Kingdom of the Crystal Skull smacks much more of a cash-in. This financial incentive is another criticism many film-goers have, but making money is the point of most movies, so why should this Indy adventure be treated any differently. There were a number of scenes in the film which were blatantly unrealistic, but the previous films contained as many obvious impossibilities that were simply part of the magic of Indy. Jumping out of an airplane and sledging down the Himalayas in a dingy, sneaking onto a German submarine from the open sea (exactly where would you hide? ), or diving under a burning lake of petrol are all part of an average day in the life of Indiana Jones. The Kingdom of the Crystal Skull certainly delivers on the entertainment aspects, with so much happening in its 124 minute runtime that you barely have time to take it all in. The storyline is perhaps a little hit and miss, and many have remarked that they weren’t particularly impressed with the extra terrestrial aspect (no doubt more into the religious mysticism of the other films) though the oodles of action knitted the scenes together well enough. Shia LaBoef probably deserves an award for the least annoying new character of recent years. If there are future films planned it seems clear that LaBoef’s role in this film was fleshed out to provide a possible successor to the ageing Harrison Ford. The latter’s age is humourously dealt with, with Indy playing a far more conservative role in his older years, often times pointing out the dangers to his more impetuous companions. The film really grips its 1950s environment, something the other films largely glossed over, from the Fonzi-like character of LaBoef, to the nuclear tests and the cafe brawl set to the tune of Shake, Rattle & Roll. The music of course is first rate, which is little else we come to expect from John Williams, though as he himself admits, getting back to working on an Indiana Jones film was like wearing an old pair of gloves (i.e. he didn’t have to work too hard at it). It was also rather nice to hear some authentic Russian in a film for a change instead of the usual hashed attempts—and all credit to Cate Blanchett for trying. There were however plenty of poor elements to the film. The promised CGI rebate wasn’t forthcoming, with many scenes obviously touched up and others overly reliant on the green screen. The ants scene in particular was virtual plagiarism of The Mummy. Mutt’s Tarzan-esque swinging through the jungle was more than a little on the childish side, and whoever dreamt up the atomic blast scene was clearly enjoying some illegal substance or other, although the humour just about made up for it. The film also suffered from a deluge of poor supporting characters. Sullah stand-in character ‘Mac’ turned out to be more of a pointless confusion than anything else, given that he revealed himself to be a mole almost from the off (which the FBI confirmed), the unnecessary double-agent shenanigans did little to disguise the fact that he was the obligatory “moral death” character (see Elsa Schneider in The Last Crusade or perhaps Rene Belloq in Raiders of the Lost Ark). Marion Ravenwood’s return might tie up some loose ends but her demeanour made the whole jaunt down the Amazon seem more like a family vacation than a brutal race against time. In fact very little in the film smacked of danger, perhaps the key reason that the film really failed to live up to its predecessors. At no point did Indy ever look to be in any real trouble, even as a guest of the villain Irina Spalko. Whilst the Nazis had to be transplanted by the Soviets for reasons of chronology, the end result was a much more carnival atmosphere to the fight against evil and life and death situations of the earlier series. Ultimately, your reaction to Indiana Jones and the Kingdom of the Crystal Skull depends mostly on your attitude and expectations. If you hope that this latest offering will enable you to relive those childhood memories and the magic of the earlier films, then you will only be disappointed to find that time has changed us no less than it has changed Indy. On its own merits, The Kingdom of the Crystal Skull delivers as an action movie but perhaps too much for its own good. Had the action been toned down a little and made more believable, and the script toughened up to make us will Indy to the finishing line (instead of merely willing it to finish) then the film would have been deserving of the box office receipts it will no doubt take. Harrison Ford deserves all the credit for reprising the role, and his on-screen charisma makes the film immensely more watchable than its constituent parts alone. It’s definitely Indy, but not as we knew him. Wer mich noch nicht kennt, lernt mich nun (richtig?!) kennen: Caro’s Stöckchen muss schnellstens beantwortet werden. Hier also 52 Antworten auf 52 Fragen, bei denen keiner weiß, wo sie eigentlich herkommen. 1.Wann bist du heute aufgestanden?